When people think of great European cities, the standard list includes Paris, London and Rome, which of course all certainly belong on the list. Not too many people would name Kraków, and largely because they don’t know much about it. The Royal Way in Kraków, which is the main thoroughfare through the old town. Very little vehicular traffic allowed in the old town, making it a pleasant place to walk. Kraków was our favorite city in Poland and it’s one of our favorite cities in Europe. We love it because there are many things to see, it has a very classy feel to it, the people were wonderful, we had a great place to stay and the food (if you like hearty fare) was excellent. Kraków is a large, modern city, but the charming old town is relatively compact. 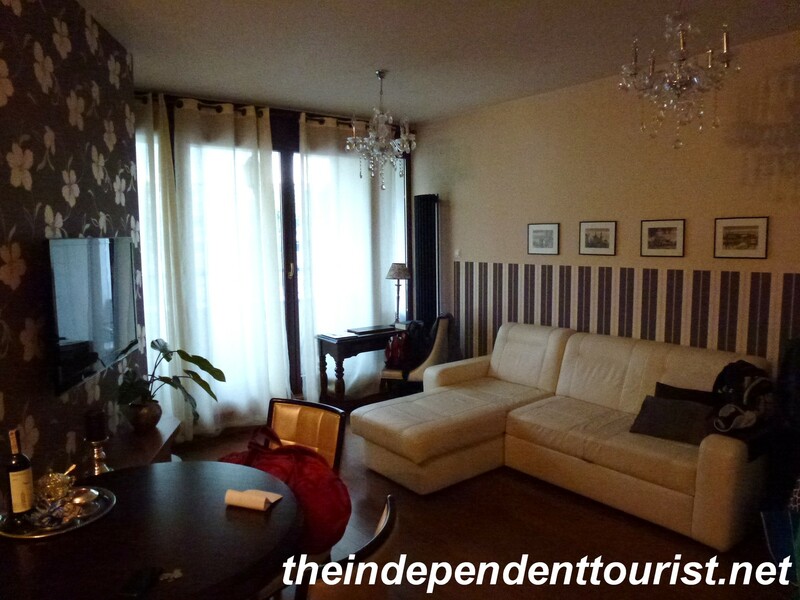 Our perfect apartment in Krakow, just a few minutes by foot from the old town. It is called Krakow Parkside Apartments. Highly recommended. This is the first of three posts on Kraków. This great city also makes a good base for exploring the remains of the infamous Auschwitz Death Camps as well, which are located about 66 km (41 miles) west. For a map of places we visited in Poland, click here. Below are a few of the things that make Kraków a great place to visit. The list of things to see could go on and on, with a number of other museums, churches, statues and other historic places that we simply did not have time to visit. Horse Carriage Rides. 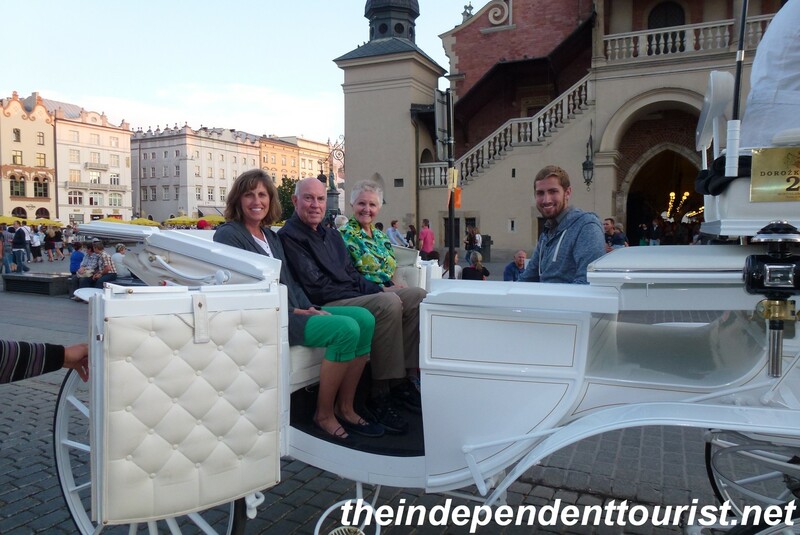 A highlight of visiting Kraków is taking a carriage ride around the old town. The rides start in Rynek Square and go to the north edge of old town before heading to south to Wawel Castle and returning to the Square. 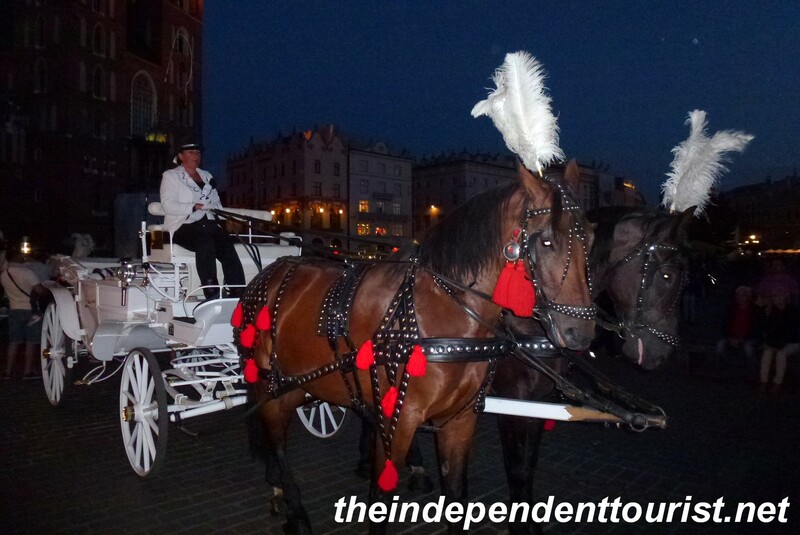 The stately horse carriages in Rynek Square. The ride cost about $10 US per person. It was a fun way to see the city and to enjoy the atmosphere. The carriages, drivers and horses are dressed up and ready to show you the town. Getting ready for our ride. Kraków Fortifications. Much of the original city was destroyed in the 13th century by the Tatar invasions. The walls and towers we see today were built afterwards in the 13th – 15th centuries. The Barbican, one of the few surviving structures of its kind in Europe. It was built around 1498. It has seven turrets, 130 loopholes (for firing arrows) and the walls are 3 meters thick. 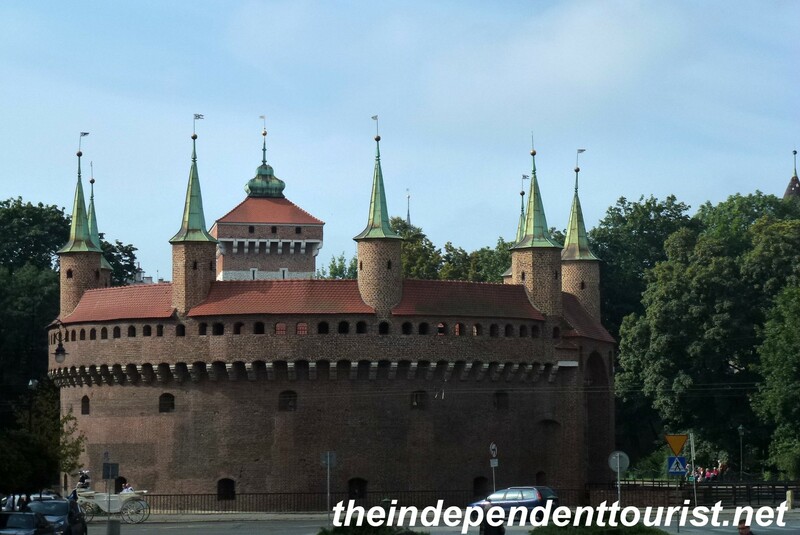 It helped defend the Florian Gate, which is part of the remaining defenses on the north side of Kraków’s old town. What remains of these fortifications is on the north side of the old town. Although many of the old walls were torn down in the 19th century, there is a ring-shaped park and walking paths that encircle old Kraków, following the foundations of the city walls. Part of the old city walls, near the Florian Gate, the only one of the eight original gates remaining. For a pleasant stroll and variety in exploring the town, take advantage of these paths. Rynek Główny (Square). 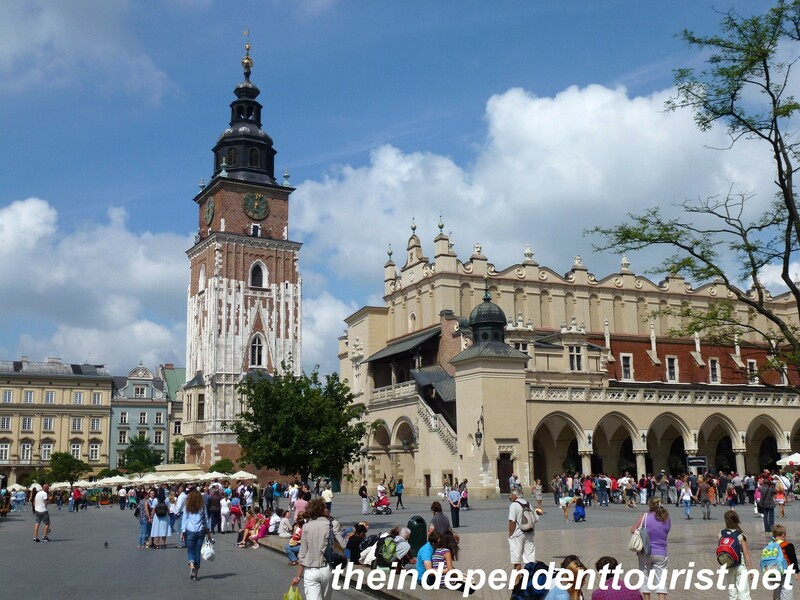 This is the heart of old Kraków and is the largest medieval square in Europe. Its layout was drawn up in 1257. During our visit, there was a festival going on, with lots of music, dancing, and numerous food stalls – we found it hard to pass any of these up! Sausages, potatoes, breads, deserts and other Polish specialties were to be found everywhere. 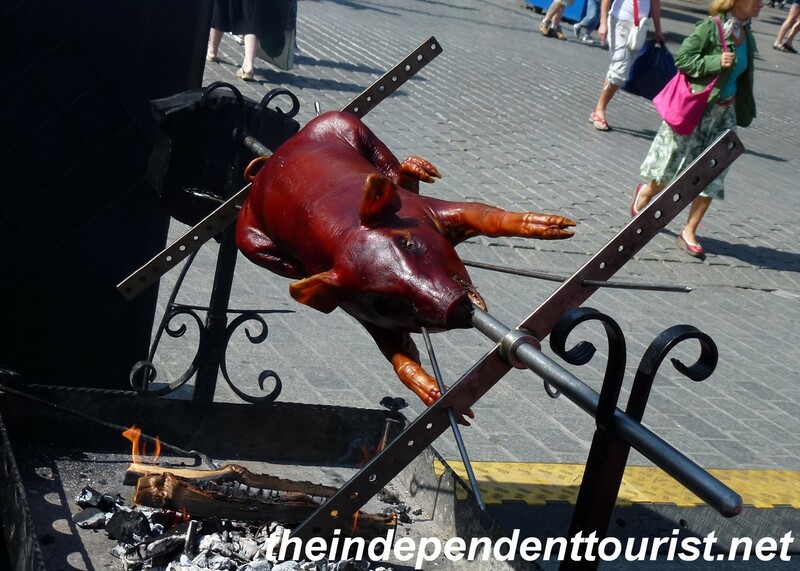 A roasting pig on Rynek Square. The tower on the left is the only remaining part of the 15th century Town Hall. 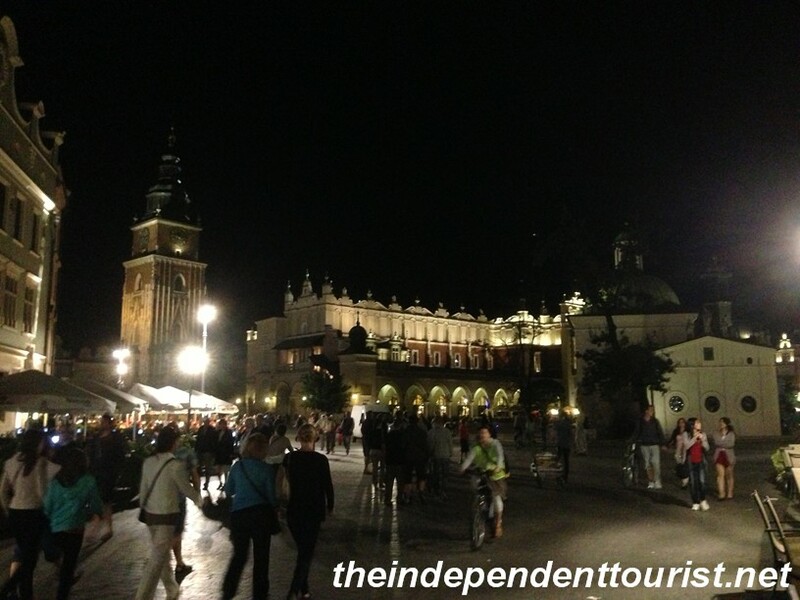 On the right is the Cloth Hall, both are in the central part of Rynek Square. Also in Rynek Square is the Cloth Hall, which was the center of Kraków’s medieval clothing trade. There are numerous shops here (and a good place to get gelato), as well as the ticket office and entrance for the “Rynek Underground” exhibit, which provides an extensive view of excavated ruins underneath the Square, and exhibits of medieval life in Kraków. 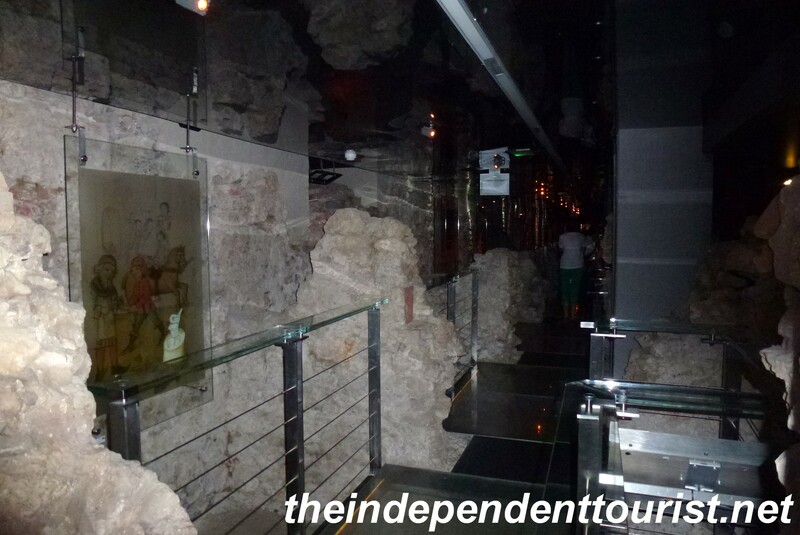 A view of some of the medieval ruins in the extensive underground displays. Hard to get good photos, pretty dark down there. Come to the Square at night for special atmosphere. There are lots of good restaurants around the Square. St. Mary’s Church with its uneven towers faces Rynek Square. Rynek Square is also the location of St. Mary’s Church, one of the most beautiful churches in Poland (and Europe for that matter). It is home of the Veit Stoss wood-carved pentaptych (three panel) altarpiece which took 10 years to complete and was consecrated in 1489. It is magnificent, and is considered one of the most important pieces of medieval art of its kind. 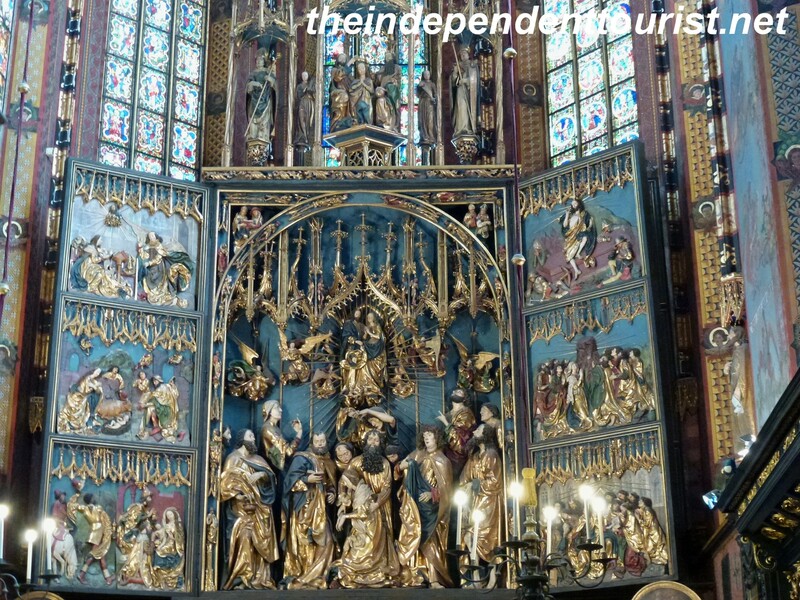 The marvelous Veit Stoss pentaptych in St. Mary’s Church, Krakow. The pentaptych is only opened at certain times during the day, so check across the street (to the south of the visitor’s entrance) for times and tickets. 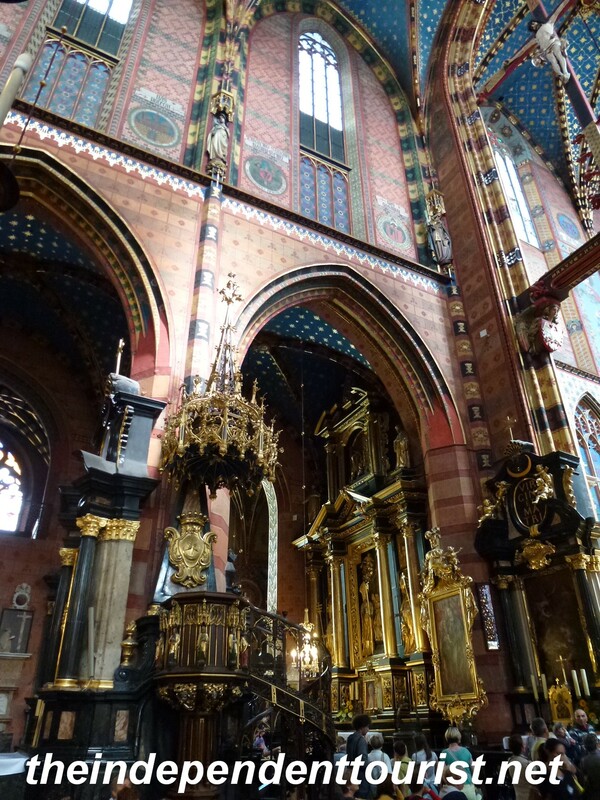 Another view in St. Mary’s Church – it takes awhile to absorb all the artwork in this church. Church of SS Peter & Paul. This is a Jesuit church dating back to 1583. It’s on the Royal Way from Rynek Square to Wawel Castle, and has statues of the 12 apostles on columns at the front gate. Church of SS Peter & Paul. Note the statues of the 12 apostles in front. 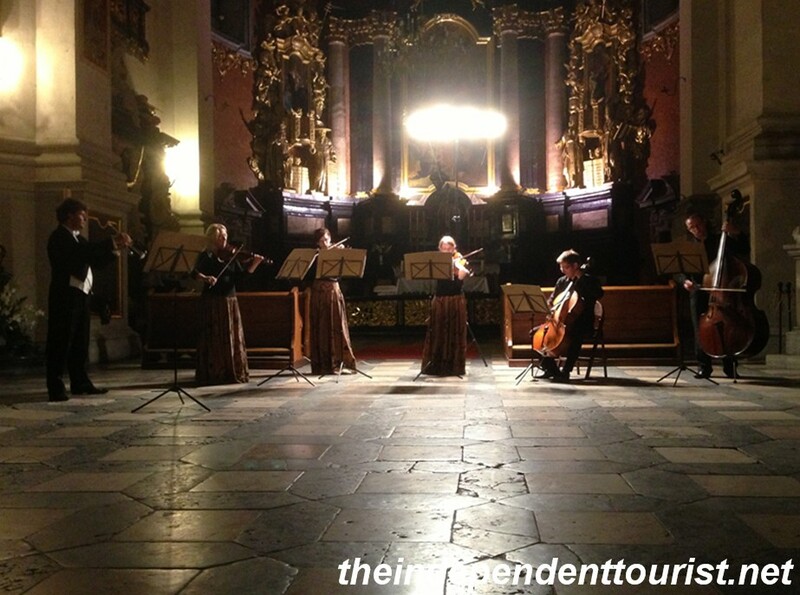 We were able to attend a concert in the large open interior on a Sunday evening, with a talented ensemble playing a number of classical compositions, including Vivaldi, Chopin, Bach, Mozart, Handel and others. This was particularly delightful given the setting and acoustics of the church. 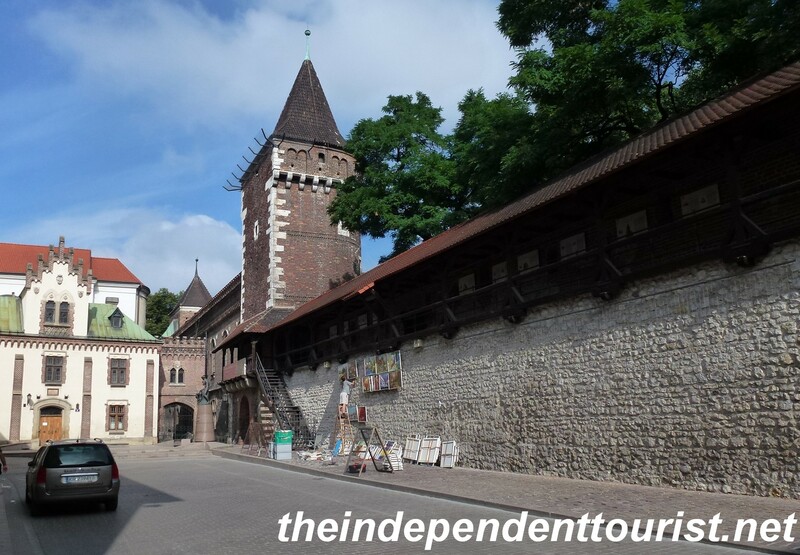 In future posts I will share some images of Wawel Castle and the Jewish Quarter, including Schindler’s Factory (recall the epic Steven Spielberg movie “Schindler’s List”). 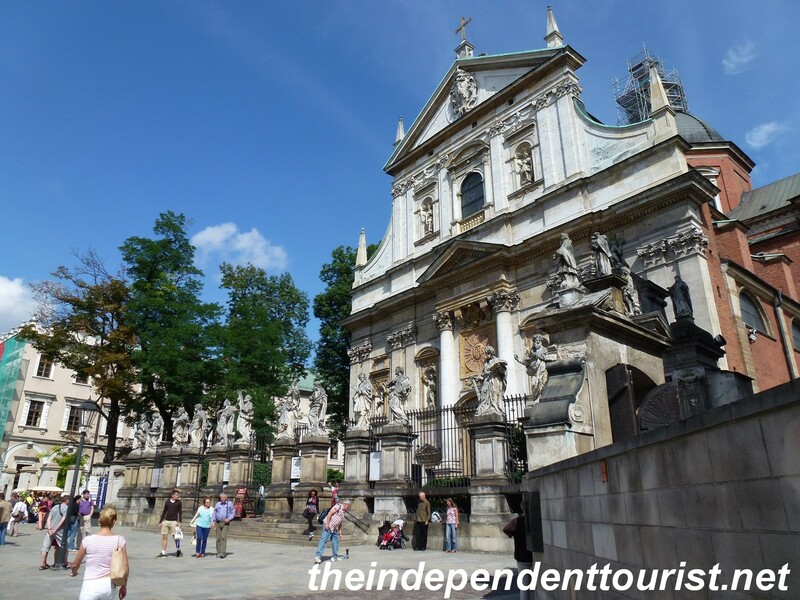 Posted in Poland and tagged Krakow, Things to do in Poland, Things to see in Poland on August 17, 2014 by Paul Terry.